*Love Struck* Here Are 5 Of The Best Makeup Looks We Spotted At The Ambani Wedding! The Ambani wedding is only just beginning! With a wedding invite fit for royals and pre-wedding festivities that had more star power than an IIFA award ceremony, one thing is clear, Mukesh Ambani is going to leave no stone unturned for his beloved daughter Isha! And boy is she, one lucky girl! It started off with her romantic engagement ceremony at Lake Como, followed by a number of home-poojas (where she wore Sabyasachi, mind you!) to a Sangeet ceremony in Udaipur! Doesn't that sound like the wedding of your dreams? I'm sure most of us wouldn't even dare to dream so big! The grand wedding (finale) is rumoured to be held in Mumbai on the 12th of December and boy are we in for a treat! The photos and videos from her Sangeet are bound to leave even the Bollywood-averse fans starstruck. Beyonce and Hilary Clinton were just some of the bigwigs who attended! Here's more scoop on the guestlist! With so many celebrities floating around the venue, we're bound to have more than our fair share of inspiration. Among all the makeup looks, some bold, some that we'd like to forget here are the 5 BEST looks we spotted at the Ambani wedding! Yes, only the Ambanis could bring Beyoncé to perform in India. If there's one thing you should know about Beyoncé, it's that she has a magnetic energy on stage. 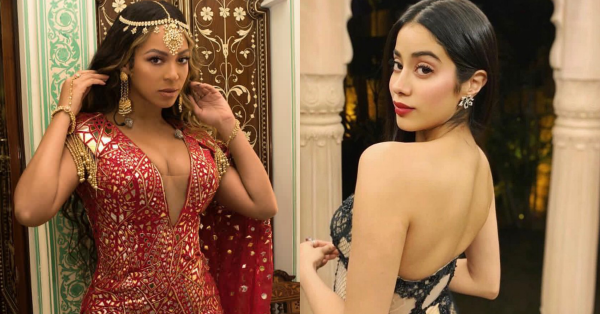 For the Indian wedding, seeing Beyoncé in Indian attire complete with a maang-tikka blew our minds! Her makeup too was much like her, perfection! Shimmery pink eyeshadow topped off with oodles of mascara and a popping highlight on her cheekbones. After her very own happily-ever-after, DP has nailed every public appearance she's made. Those stylists and makeup artists sure deserve a standing ovation. She paired this stunning red gown with a fierce winged liner, a high pouffe, and a low pony! For that fierce cat eye, you'll need a gel eyeliner and a little patience. Check out this post for all your cat-eye queries. Here's Janhvi is one of her iconic, statement lipstick makeup looks again. She paired that gorgeous off-shoulder gown with a flirty, youthful makeup look. Moral of the story? You can't go wrong with a flush of blush, bold lips, and oodles of mascara. Following closely in Jahnvi's footsteps was her sister, Khushi. She paired her gorgeous silver lehenga with a contrasting lipstick. If your lips are your best-defining features, let your lipstick do all the talking. Here are some of our favourite lipsticks for plush, kissable lips! Bet you can't keep up with the Kapoors either. Kiara is another B-town newbie who always gets her makeup right. At the Ambani wedding, she worked a bold makeup look with a black and silver lehenga. Contrary to what you've heard, a bold red lipstick can be paired with a smokey eye, but only if your outfit is understated. Here's a detailed tutorial from Bollywood MUA, Namrata Soni on how to create this smokey eye.